Living Area 5,338 Sq. ft.
Sited perfectly on a majestic 3.67 acre parcel sits this spectacular custom built colonial. Hand crafted by renowned local builder Michael Hutchinson, the home sits at the end of a gorgeous tree lined 500 foot driveway, offering long distance views, privacy and a premier location perfect for commuters; yet minutes from Newtown Boro. The three story foyer entrance reveals beautiful random width pine floors throughout the first floor, 9 ' first floor ceilings, exquisite custom millwork and great floor plan. All rooms are generously sized and bright, with great views in all directions. To the right is a large family room with cozy stone fireplace, built in book shelve / entertainment center with 60" flat screen TV. To the left is a formal living room, formal dining room, office/ library with fireplace and built- ins, which leads to a 3 season screened in porch overlooking the pool and rear yard. The gourmet kitchen features center island, new stainless steel appliances, adjoining breakfast area also overlooks the pool. A large laundry room, powder room and three car garage complete the first floor. The second level features a large and spacious Master Suite, replete with sitting room and fireplace, bonus exercise room, walk in closet and make-up area, luxurious Master Bath with jetted tub. Three additional bright, airy and large bedrooms and full bath complete the second floor. The third floor encompasses and large suite, with bedroom, living room and full bath; ideal for guest or in-law if needbe. The lower level awaits your personal design and finishing touch. 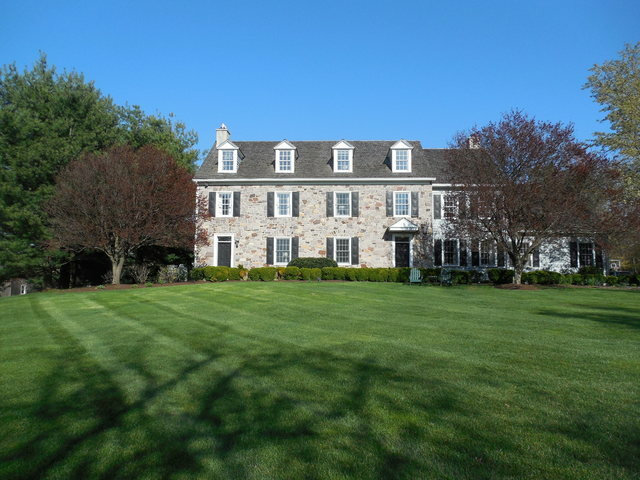 Outdoors, the property has so much more to offer – Large trees and manicured landscaping, large Brazilian hardwood deck, 50' long custom pool recently entirely refurbished, and the peace and tranquility that one would expect from a non-cookie cutter Upper Makefield estate property. Since its purchase in 2011, the sellers have made significant capital improvements, including but not limited to: New cedar shake roof, back-up generator installation, complete pool renovation, geothermal heat installation, energy efficient insulation and much more. Council Rock HS North location, minutes from Newtown, New Hope, I-95 and New Jersey. Immaculately maintained and in move-in condition. This extraordinary property awaits your visit.